The Start Menu is back A Guide to the Windows 10 Start Menu A Guide to the Windows 10 Start Menu Windows 10 fixes the Start Menu dilemma! 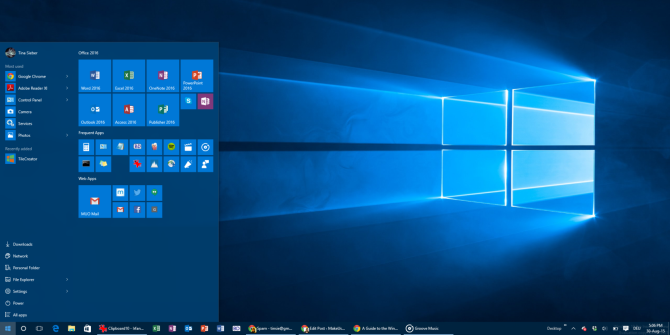 Getting to grips with the new Start Menu will supercharge your Windows 10 experience. With this handy guide, you'll be an expert in no time. Read More and has once again become the pivotal point of Windows. How could Microsoft ever remove the iconic Start Menu Start Me Up - Windows 95 Turns 20 & Still Rocks Start Me Up - Windows 95 Turns 20 & Still Rocks 20 years ago the Rolling Stones cranked up "Start Me Up", and Windows 95 was born. We revisit history, discuss why Windows 95 was a big deal, and how it compares to Windows today. Read More in the first place? It’s different though, with the classic design now integrating the tiles introduced with Windows 8’s Start Screen. If used well, the tiles can add a lot of value to your Windows experience. In particular, visually-minded users will appreciate the creative freedom that tiles offer. Here we’ll show you the potential of tiles and along the way you’ll learn about their different features, as well as other ways to customize the Start Menu. On a classic desktop PC, tiles may seem like a waste of space. Once you’re using Windows 10 Quick Guide to Windows 10 for Windows 8 Users Quick Guide to Windows 10 for Windows 8 Users Windows 10 is just around the corner and if you're running Windows 8 you will be able to upgrade for free on July 29. Let's take a look at what the big changes are. Read More on a hybrid or mobile device, however, where scrolling through menus can be tedious, tiles quickly become indispensable. You can pin almost any item to the Start Menu (right-click > Pin to Start) and it will show up as a tile. We’ve previously shown you how you can manage your tiles, i.e. Unpin from Start, Resize, or re-arrange them. Just right-click or long-press a tile to see which options come up, drag-and-drop a tile to move it around, and don’t miss out on the option to give a group of tiles a descriptive name through the title bar. Don’t like the name of a given tile in your Start Menu? Right-click the tile, select Open file location, then rename the respective file in Windows Explorer. While you’re at it, you can also change the icon used for the tile. In Windows Explorer, right click the file, select Properties, in the Shortcut tab click Change Icon…, and select a given icon or Browse… for an alternative one on your computer. Shortcuts can help you access a file or app from various locations. Universal Windows apps don’t provide an obvious way to create a shortcut, but we know of two different methods. The first is almost too simple; try to drag an app from the Start Menu to the desktop. What you’ll get is a shortcut on the desktop and the app will still sit in your Start Menu. Alternatively, you can open the Applications shell folder, which hosts all applications installed on your computer, including Universal Windows apps. Press Windows key + R to open the Run dialog (or long-press the Start Button and select Run from the Power Menu), type shell:AppsFolder, and select OK . From here you can create shortcuts to any of your applications. Once you have created a shortcut, you can rename it, change its icon, and pin it to your Start Menu. That’s how you can create custom icons for Universal Windows Apps. Now that you know what you can do with tiles, lets see how you can expand on that. These tips will help you put your creative energy to work and turn your Start Menu tiles into a piece of art. Tiles are the perfect canvas for game covers. The Universal Windows app Steam Tile creates beautiful Live Tiles for your Steam titles, as demonstrated by Reddit user xpopy. Since he didn’t like how Steam Tile launches games, he went and manually created shortcuts to individual Steam games. The process is a little convoluted and not as visually pleasing as Steam Tile; unfortunately, shortcuts only support small or medium sized tiles. 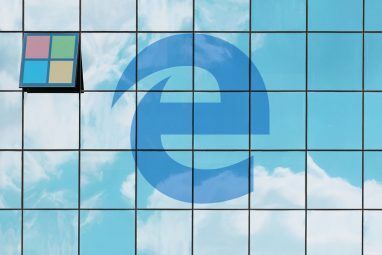 Chrome lets you add any website to the Windows Taskbar 7 Tips for Customizing the Windows 10 Taskbar 7 Tips for Customizing the Windows 10 Taskbar The taskbar remains a staple feature in Windows 10. It's been given a fresh look and new features, including Cortana. We show you all the tweaks to make the taskbar your own. Read More . Although in Windows 10, it actually adds them to the Start Menu as a tile. Click the Hamburger icon in Chrome, go to More Tools > Add to taskbar…, and check Open as window. The tile will now launch the website in an app-like window Use Chrome to Create a Windows 10 App from Any Website Use Chrome to Create a Windows 10 App from Any Website This simple Chrome trick will help you appreciate Windows tiles. It also works on Windows 8. You can turn any website into an app that launches in its own window. Perfect for small screens! Read More , without distracting toolbars or tabs. This is particularly neat for websites like Gmail, Facebook, or YouTube. Compared to previous Windows versions, the All Apps list appears stale and is difficult to navigate. Moreover, you cannot easily remove items, unless you’re happy to uninstall them. With the file location trick already described above, however, you regain some flexibility. Classic desktop software is added to the All Apps list with a folder, but you really just need the Dropbox application shortcut in that list. When you right-click and item and select Open file location, you will access the Programs directory, based on which the All Apps menu is created. This is where you can move shortcuts or create additional folders. For example, I could move the Dropbox shortcut from the Dropbox folder to the Programs directory, then delete the Dropbox folder. You have to reboot for the latter to take effect. Also note that you can quickly jump to a different location in the All Apps list by clicking or long-pressing a letter, then selecting your target from the menu that comes up. Compared to the Windows 10 Preview, your options here are rather limited and none of them can be found in the Start Menu itself. Press Windows + I or launch the Settings app through the Start Menu and navigate to Personalization > Colors. Per default, the Start Menu and Taskbar are dark grey, but you can make them adapt the Windows-wide accent color. This in turn can be picked based on your background or you can manually select one. Finally, you can make the Start Menu transparent, but you cannot customize this setting. You can change the size of the Start Menu by dragging it by its top or right edge or you can switch to a full screen Start Menu, better known as Start Screen. And you have two different options here: you can either switch between Desktop and Tablet mode, with the latter automatically maximizing all your windows and activating the Start Screen, or you can choose to permanently use the Start Screen via Windows Settings. Both methods will give you instant results, no reboot needed; it’s the smoothness of Continuum Continuum: Switch Between Windows 10 Desktop & Tablet Mode Continuum: Switch Between Windows 10 Desktop & Tablet Mode Windows 10 recognizes your hardware and instantly chooses the best display mode. When you connect your Windows 10 Mobile to a larger screen, you'll get a PC-like experience. That's the smoothness of Continuum. Read More . To toggle between display modes, open the Action Center from the notification area or press Windows key + A, then click or tab Tablet mode; one of the tiles at the bottom. For the permanent solution, open the Settings app from the Start Menu or press Windows key + I, then head to Personalization > Start and set Use Start full screen to On. Whether you choose Tablet Mode or a full screen Start menu, the Start Screen will look the same. What differs between the two modes is the behavior of the Taskbar. In Tablet Mode it’s hidden and when you hit the Windows key or swipe up from the bottom, you’ll notice it’s empty, save for the default icons. To switch between applications, you now have to tap the Task View button or swipe in from the left. Chances are that even once future updates roll around, you’re not satisfied with the new Windows 10 Start Menu. Fortunately, you can always install a third party Start Menu 2015!? No Way Microsoft! How to Get Your Windows 8.1 Start Menu Now 2015!? No Way Microsoft! How to Get Your Windows 8.1 Start Menu Now Windows 8 won't get a native Start Menu after all. But why wait on Microsoft? 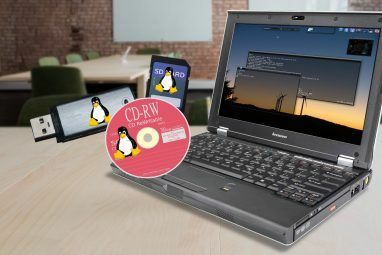 Here's how you can help yourself with third party tools like Classic Shell or Start8 and other workarounds. Read More , such as Classic Shell. These tools can either replace the default Windows 10 Start Menu or you can choose settings to allow access to both menus. 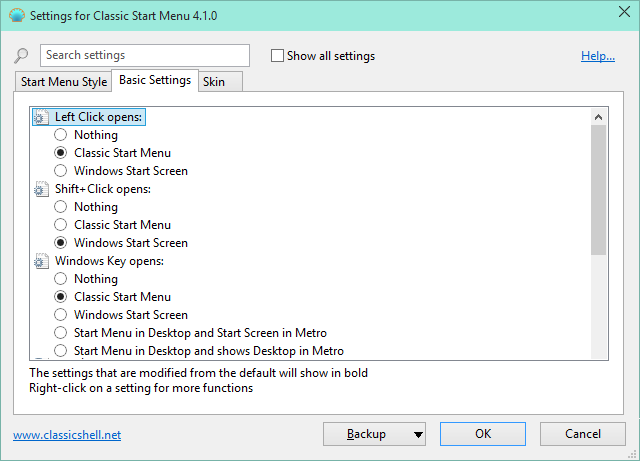 Into Windows recommends you pin the Start Screen option from Classic Shell to your Taskbar, so you have a separate button for each Start Menu and don’t have to recall special shortcuts. As a side note, some alternative Start Menus, including Start Menu Reviver, also work for Windows 7. How Did You Change Your Start Menu? We would love to hear or see what you have done to your Start Menu! How are you using tiles? Have you applied an artistic design 10 Quick Ways to Customize & Personalize Windows 10 10 Quick Ways to Customize & Personalize Windows 10 Not all of Windows 10's default settings will float your boat. We show you all the possible ways to customize Windows 10 in a simple, step-by-step guide. Read More or have you organized your tiles in a specific way? What else have you done to make the Start Menu work for you? Or are you using a completely different way to launch software and folders Creative Ways to Launch Software & Open Folders in Windows Creative Ways to Launch Software & Open Folders in Windows Tired of searching for shortcuts on your desktop? In Windows, you can quickly access anything you want, you just have to take the time to set it up. We have compiled your options. Read More ? Tell or show us in the comments! Hi! This was a good start to what I want and do not want in my start menu. Ideally, I'd like to put these all into a folder called "microsoft". Hey Muff, I'm not quite clear which "divider on top" you're referring to. Is this in the Windows 10 1709 Start Menu? Could you share a screenshot? create a short cut to desk top cut and paste in location above . a good idea is to rename and start with a number. Thank you for sharing, Kevin! The Programs folder within the Start Menu also makes for a wonderful Taskbar Toolbar. You used the word "HACK" in the title.. and this is using features provided...not hacking anything nor tricking or adjusting anything not provided as an option. The original version of this article contained a code that would restore a different version of the Windows 10 Start Menu. When this "hack" stopped working and the Start Menu changed, we updated the article but kept the title. You can check this article's history on the Wayback Machine. The fact that we updated an article months after it was published should highlight that we're taking our content and our readers seriously. Some of our titles may occasionally border on click bait because we want to capture the attention of readers for the high-quality content we aim to publish. The article is due for another update. What tips would you add? Used Shell. Thank you so much for recommending it! So old-school! The icons of my start menu are locked and there is no way to move or delete them. Microsoft has advised me to new install Windows 10. I did it but the icons are still blocked. Have you any suggestions to unlock them? You mean the Start Menu tiles on the left-hand side? Can you click them at all? How did you re-install? Did you try creating a new user account? You can't move microsoft apps from the store around anywhere, except from within the area dedicated to them on the start menu (on the right hand side of your menu, or from the tiled app screen in full screen or tablet mode). So you can't rearrange them by cutting, copying or pasting them into new shortcut folders in the start menu, as an example. You can't delete them from your menu either without uninstalling them. You can however drag and drop microsoft store apps with the left mouse button from your menu on to your desktop, which will create a new shortcut. If you then click on 'Programs' in the address bar at the top of the window, this will show your installed programs in full. Note that some programs that microsoft pre-installs, are treated as 'store apps' and cannot be moved (they will not show). I believe the two above locations are the same as windows vista, 7 and 8 when it comes to the start menu. You can create folders inside the Programs folder and place new shortcuts or folders. In 8 and 10 however, your changes may not show until you restart your system. Tiles? I'm an adult, don't need FisherPrice junk on my computer. I went right back to Win8.1 and will stay there until I have time to get Classic Shell loaded. You think M$ would have learned something from Win8. I also hate that you can't select specific graphics to use use for a screen saver slide show - you can only select a folder. Yes, there is a work around but what a hassle, and why change it? I can not see any advantage at this point to going with win10. Janet, you can remove all of the tiles from the start menu and then change the width to only the size of the apps list. Based on your hate of tiles, I'd say Windows 10 is better than Windows 8 because -- as Troy wrote -- you can get rid of all tiles in the Start Menu. In Windows 8 you're stuck with the Start Screen. By the way, Classic Shell is available for Windows 10 too. In Win7 I was able to permanently display program icons from a toolbar in the taskbar. I have tried everything to recreate the same in Win10 to no avail. In Win 10 I have to click on the toolbar arrow and a list is displayed with icons and program names. I want to permanent display the toolbar icons, with icons only i.e. without program names. Are you referring to the Quick Launch Toolbar? To make it show like a toolbar, rather than a drop-up list of items, you have to unlock the Taskbar and move the toolbar to the left. Also right-click and uncheck "Show title" (of the toolbar) and "Show text" (of the icons). You can move the toolbar all the way to the left by grabbing its title (in that case make sure it shows) and just dragging way over. Eventually it will jump across anything in the way. Works like a charm for me and I'm sure it will work for you too. Neil, did you mean "from Start Menu"? Simple - drag the program icon to Taskbar. But, as noted, Win 10 has no icons in Start Menu except for nondescript black and white icons. You can create icons - sort of stupid work, doing what all those high-paid software developers should've done. You can also pin nice color icons of your 3-rd party apps to both Start Menu and Taskbar. Tina, thanks for Classic Shell - will try it right now. If only they could bring that nice multicolor XP/7 Win button to the Taskbar. Bleak and crooked window icon looks terrible. Neil, if you generally just want to display program icons in the taskbar, you can also right-click the icon wherever it is and select "Pin to taskbar". The advantage of that method is that you have access to the jump menu (right-click the taskbar icon and see), something the Quick Launch bar is missing. The disadvantage is that you can't pin files and folders to the taskbar, only program and apps. Al, make sure you install the latest version of Classic Shell before you upgrade to the Windows 10 Anniversary Update, in case you haven't yet. Does anyone know where the information for the live tiles is store? Is it in the registry or... just wondering. Can anyone tell me, if the Icon (or for that matter the App "Photos") in the Win 10 can be deactivated (not uninstalled - that would take all my pictures from Win 7 out). I am not using it. It has and uses the features of a toy, not a serious photo managing program (application). I am using the Microsoft Picture Manager from my Office 2003 and/or Corel's PaintShop Pro for photo-enhancing, and managing all my pics, using my own system of directories, folders and sub-folders. All of "My Pictures" are duplicated in "Photos" (randomly - not systematically), and if I try to delete any of them, guess what - I loose it from my Original files. Fortunately, I caught on to that issue soon after I had installed the Win 10, and immediately restored those "lost-at-that-time". Now I feel, I have to keep an App that is worthless and just a nuisance to me, I am not using it, yet it is taking bytes on my hard drive, and shows 30,000 photo and screenshots without any order, if I open that Icon in the Start Menu. Is there a way to remove/uninstall the App, without affecting my Win 7 "My Pictures" Folder? I replaced the Photoviewer in default apps with xnviewMP as a more effective image browser. You should be able to remove the w10 photo app without affecting your images, though I've never used the "my pictures" in favor of just having an "Images" folder under My Documents, so YMMV. By accident I right clicked on the start bar, section "most used": more ->"don't show in this list". Now I want to get back this application (Excel) into this list, no success. I switched off and on "sow most used apps" under Personalization, but this app does not come back. The only think I could find was this discussion on TechNet. Maybe disabling and re-anbling the Most Used can do it. The setting is found in Settings > Personalization > Start > Show most used apps. Have you found a solution in the meantime? Please share! I like Better Start Menu (http://forum.xda-developers.com/windows-10/development/app-startmenu-create-custom-tiles-t3187654) a whole lot. It lets you do just about anything you want to your start menu icons. It takes a bit of work to get it going, but it's very worth it. Allows you to fully customise your start menu tiles via a visual manifest xml file stored in the applications folder, so you're not stuck with the default icon on a blue background. I wish there was a way to make the non-windows program icon full sized in the tile. Hi. On Windows 7 Home X64, I had created a folder in the start menu labeled Utilities, that held most of the links to the utility-type programs I used regularly - similar to the way I had then arranged in an XP-style All Programs folder. When I upgraded to Windows 10, it created the Utilities folder, and the folders and links that I had in the folder are still there, but not listed in the All Programs Start Menu. However, I don't seem to be able to get into that folder to be able to add some of the other utility programs that I'd like to add - and have organized all in one place instead of scattered around alphabetically. There is no properties dialog that I can see, and I don't have permissions to enter it from File Explorer. Any Ideas? This is not what I wanted. I have not problems with Windows 10 except for the explorer for files "I HATE IT", I don't want to see details for every folder in my system. I want to be able to set "list" or "large icons" as my default on every folder and have the damn system remember what I want, like the old windows explorer would do. I don't want a damn Office setup on top, I want a single bar that allows me to have a drop down menu to choose what viewing style I want. Because of this horrible flaw in Windows 10, I have moved forward and installed the much superior Windows 7, which doesn't tell me what I have to use. When you open the start menu, it shows your name, and for some reason it says my name is "Lily Berkshire". Maybe someone of that name hacked me or something, and I'd like to know how I can change that. Are you using a local user or a Microsoft account to log into Windows 10? If you're using a local user account, simply change the settings for your user. Maybe someone who had access to your computer played a trick on you and changed your name. Go to Settings (Windows key + I) > Accounts to find out what kind of account you have and change the settings. I'd like to see a 3rd party start menu that restores the UI that win 10 had during the 9k builds of the preview. It was perfection. Greetings, and thanks! I was looking for just this sort of info with my Win7 comp, newly upgraded to Win10. One comment: "Right-click the tile, select Open file location" does not work: that option is not available. Help!?! Are you trying to right-click a Universal Windows app? Please see the other solution for that case, i.e. creating a shortcut for the Universal Windows app, adding it as a tile, and renaming it as originally described. On the Start screen, right clicking ALL tiles does not give the option to Open File Location. Only Unpin, Resize, Turn live tille off/on, Pin to taskbar, Uninstall, although some offer less. But I think I see my error: I was trying to rename Start SCREEN tiles. I see you were talking about the Start Menu's file list, now. The term "tile" threw me off. It shouldn't matter whether you're trying to right-click a tile on the Start Screen or Start Menu, you should see the option for certain tiles (not all of them). I see the Open File Location option for desktop software (e.g. Office or Notepad), but not for Universal Windows (formerly known as modern or Metro) apps. Hence my question which kind of tiles you tried it with. Are they all apps, maybe? Well, since I wrote my question, I've added lots of tiles. It doesn't work with the tiles originally there (Metro? ), nor with ALL the ones I added from the Start Menu, or by searching in Cortana. It DOES show in SOME I've added from the latter two. It DOES show in ALL the ones I've added with this, which adds nicely to your guide above. My question was precisely to be able to redo icons for web sites I'd found a way to put on the Start Screen. I'm happy now, between your explanations above and the linked site. Hi, guys. Tina, great article as always. I'm on build 10240, and I'm not seeing the Windows 8 Start screen/Start Menu button. Has that function been deprecated? Hi Kelsey, we had a bit of a hiccup happen here. We meant to update an old article, instead re-published the old article. Fixed now, please re-read. The switch for the Start Screen / Start Menu has moved to the Settings app. I loved the old start menu from build 9926. I enabled it back in build 9978. Create a DWORD 32 name it EnableXamlStartMenu and set it to 0.